I bought a Samsung Galaxy S Mobile last week. Since then i was playing around with it. When I saw my iPad friends using Air Video to stream files from Mac to iPad in Wi-Fi i thought may be have to wait until they release for Android platform. Then i remembered i saw a allShare application in Samsung which showed it can play from server..So is that it?? Googled for it and found that its wat i was looking for.. its called DLNA. the service which can stream media from the compatible DLNA devices otherwise called as uPnP Technology. Samsung Galaxy S is DLNA certifed by default.Yupee.That was superb. So wats next.. Setting up my mac.. Thats where i told to myself i should have been using Windows 7. Yeah it comes with built-in DLNA you dont have to install any specific softwares for that, Windows Media Centre itself is more than enough. Check MSDN Blog for how to enable DLNA in Windows 7. Good luck with it but am a mac user i have to find a solution 😛 . Again Google. Got so many softwares for mac still in infancy state and nothing had a good review. so it is our choice to select. There are some paid softwares like Nullriver MediaLink, Eyeconnect. But started using Android, why dont give a try for a Open Source.? Then i landed on something called Serviio and Fuppes.I never got Serviio to work . I needed Java 6 for serviio to work unfortunately Leopard doesnt have Java 6. So I proceeded with Fuppes. So here is how to install Fuppes on mac. Though you can run the windows version using wineBottler but its good to go with the native always. Just follow these steps to install. Install Xcode, It will either be on a seperate CD or included on the Mac OS DVD. Download MacPorts from http:www.macports.org and install it. To install Fuppes You need to install the dependent libraries first. Install each these packages with the following command. Download Fuppes distribution from the repository. Now navigate to the folder you checked out Fuppes. You should see this screen now. In case if you see this error message “Cannot bind to the socket” ( i did 😉 ) you might be running other uPnP services same as fuppes try quitting that and run the fuppes command again it should work. The best thing in the Fuppes is you can configure each and everything as per your need with the fuppes.cfg file. 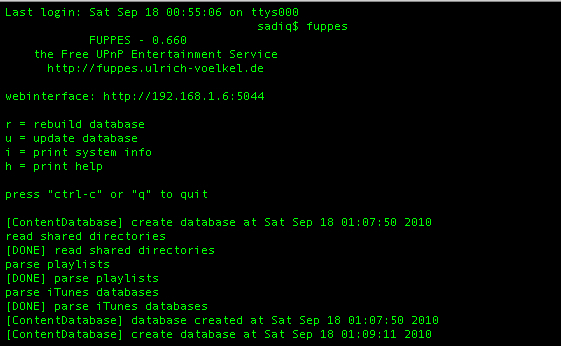 Stop the fuppes when started first time so that it will create you config in the $HOME/.fuppes/fuppes.cfg with which you can customize everything, for more information on customizing Fuppes. To revert things back to normal change True to False and execute again. So we have now everything configured lets get this thing to work. Open a browser and type the webinterface given while starting the service in my case it was http://192.168.1.6:5044 (Check the screenshot). You will get the options to add your directories. Add them and give some time to index the directories. All set now. Fire up your allShare application in the mobile. Select Play files from server on my phone. In the following screen you will see your mac listed as a server browse through the folders you added and the enjoy the streaming :). For further reference please refer wiki for Fuppes. If you dont want to go through all these steps check this one TVMobili i found that simple and powerful.